The auction came about from the realization of several factors. 2. Our current location is poorly suited for retail. We lack the space to properly display items. Our parking is minimal. But it works well for a will-call, pickup location. 4. 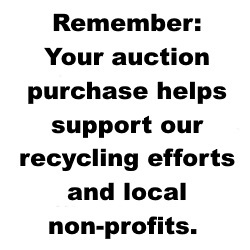 We wanted a re-use delivery model that was consignor friendly, so that other non-profit organizations can partner with us in leveraging the benefits of electronic recycling (fundraising/environmental protection). What this means to you, is that the items you’re buying are funding ESF and it’s partner organizations. You get stuff at a great price, we move it to make room for more. Everyone wins! That’s Synergy! Note: If your non-profit organization wants to get involved with electronic recycling, contact us. We’d love to grow with you. Corporate consignments/sponsorships are available as well. A company can donate their surplus electronics, we’ll handle the pickup, data destruction, and scrap recycling. The good stuff is sold and the funds generated are then given to the non-profit organization of the Corporate Sponsor’s choice. Some restrictions apply. Contact us for more information.